This diptych is an outstanding example of grisaille painting. 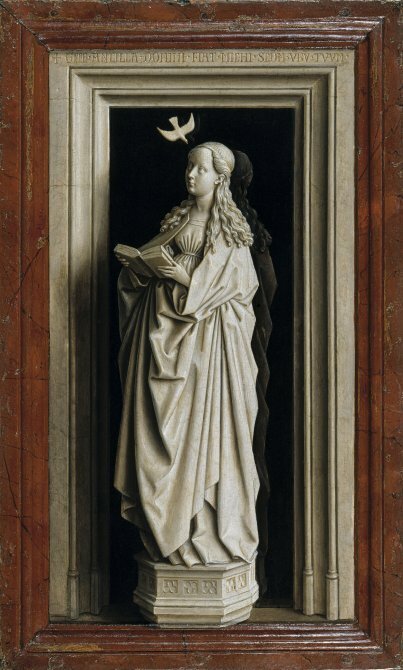 Here, van Eyck deliberately rejects the use of primary colours, painting the figures in white on a black background to create the illusion of a sculptural group. The painting forms part of a series of small-format works probably intended for private devotion. 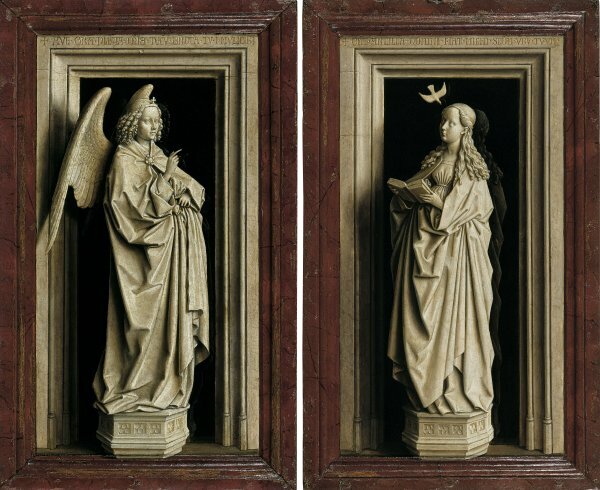 The inscriptions on the frames—a common device in van Eyck’s panels—refer to the subject of the diptych: the first and last sentences of the dialogue between the Archangel (‘Hail, full of grace, the Lord is with thee’ [I-28]) and Mary (‘Behold the handmaiden of the Lord; be it unto me according to thy word’ [I-38]), taken from the Gospel of St Luke. The frames were painted by the artist using trompe l’oeil effects and playing with the exquisite set of mouldings that decorate the panel. Jan van Eyck and Robert Campin were the founders of the Flemish School. Together they advanced towards a new concept of painting in Flanders that would eventually replace the decorative style influenced by France and Italy that prevailed in European painting around 1400. In addition, Campin’s work defined and developed the elements of this new interpretative approach, while Van Eyck played a key role in the dissemination of these innovations, promoting new concepts and ways of interpreting reality and nature. Furthermore, the work of these artists involves a conceptual element that is at times difficult to interpret but which has been termed symbolic realism. The present Annunciation, which was formerly in a French private collection, was acquired in 1933. Art historians began to study it after it was first catalogued by Max J. Friedländer in 1934 as a work by Van Eyck. Since that date its attribution has not been questioned. The date, however, continues to be debated: the painting has been related to other works by the artist such as the Dresden Triptych and Saint Barbara in the Musée royale des Beaux- Arts in Antwerp, both of 1437, but also to The Virgin and Child at the Fountain of 1439, also in Antwerp. These two panels, which form a diptych, can be placed within a group of small-format works intended for private devotion. 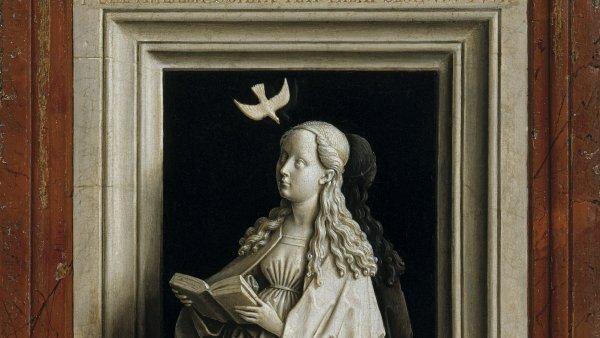 The subject of the Annunciation, taken from the Gospel of Saint Luke, is emphasised through the inscriptions on the upper edges of the fictive stone frame that reproduce the first and last phrase of the dialogue between Mary and the Archangel. Above the Archangel the artist painted Gabriel’s salutation to Mary: “Hail, thou that art highly favoured, the Lord is with thee”, and above Mary: “Behold the handmaid of the Lord; be it unto me according to thy word”. Van Eyck’s frames frequently include inscriptions in his own hand relating to the subject-matter of the painting. These fictive frames were painted by the artist himself to produce an effect of trompe l’oeil and to interact with the mouldings around the panels. Frames of this type by the artist imitate a wide range of materials, as can be seen here where they imitate stone on which the inscriptions appear to be carved. 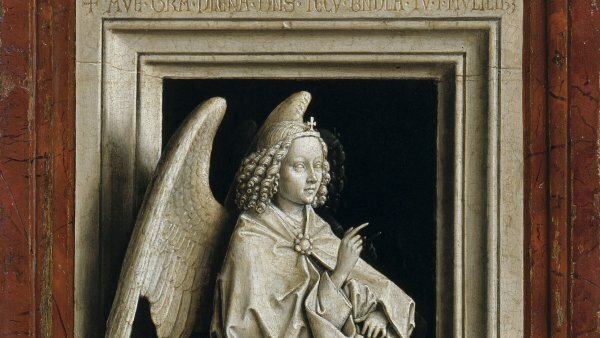 Van Eyck presented this Annunciation in the manner of a sculptural group. The figures, isolated in niches with moulded surrounds, are painted in grisaille. The figures, with their ample draperies that fall into crisp folds, are standing on hexagonal bases. The backgrounds are painted to create the effect of a smooth, black enamelled surface that not only repeats the figures’ outlines but also in the case of the Virgin reveals part of her back as if reflected in a mirror. The use of this background can be related to the mirror, a sacred object that symbolises purity itself: the speculum sine macula. From the way that they are located in the pictorial space the two figures seem to protrude over the edge of the frame. This is evident in their pedestals, in the red marble-effect frame on which the foremost edges of the pedestals have been painted, and in the projection of Gabriel’s right wing, which bends outwards to emphasise the effect of its volume through the strong shadow that it casts. Overall, the composition reveals the complexity and richness of the optical resources used by the artist. 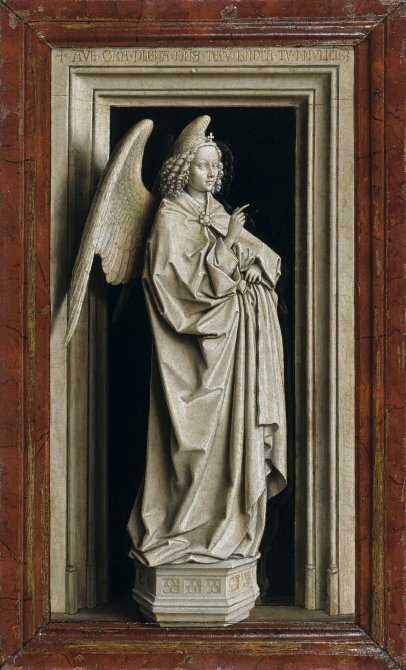 This Annunciationhas been compared to the Dresden Triptych in which Van Eyck depicted the same subject on the outside wings in grisaille, with the two figures similarly separated. According to Frédéric Elsig, the present diptych may have influenced the French painter Nicolas Froment, as it can be compared to The Annunciation by that artist on the reverse of the altarpiece with the scene of the Burning Bush in the cathedral of Saint-Sauveur in Aix-en-Provence. There are also similarities with the exterior grisailles of a triptych of The Ascension of Christand Noli me Tangere attributed to Froment’s studio. For Panofsky the present diptych, The Virgin of Canon Van der Paele and the Lucca Madonna “mark the climax of the insensibilisation des personnages”. Díptico de la Anunciación (Tabla Izquierda): Arcangel San Gabriel.